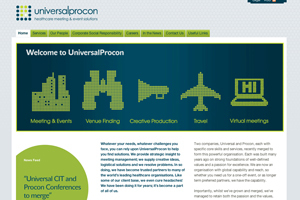 Universal Procon plans to capitalise on its close ties with sister companies Ashfield In2Focus and Business Edge Solutions and Training to win new events business. Celgene is among the pharmaceutical clients that Universal Procon has recently won on the back of its work with contract sales and marketing services firm Ashfield In2Focus. Universal Procon's new managing director, Graham McIntosh, said Celgene awarded the agency a two-year sole supplier contract for global congress management. Celgene has a strong relationship with Ashfield In2Focus, which McIntosh said contributed to its decision to award Universal Procon the contract. Universal Procon's relocation from Slough to Ashby-de-la-Zouch, to join the office where Ashfield In2Focus and training and development company Business Edge Solutions and Training are located, meant it could work closer than ever before with its sister companies, said McIntosh. This meant the three companies could offer a wide range of services, including events, to clients under one contract. "The restructure and relocation means we can leverage all of the solutions we offer to clients," said McIntosh. "Customers want more than just someone running a good event. They want a company that can take care of the brand and this is something we are seeing more and more of."